Rogoznica is a popular tourist village on the Dalmatian coast in Croatia. It lies in the southernmost part of the Šibenik-Knin County, in a deep bay sheltered from wind, about 30 km from Šibenik. In the 2001 census, the population of the village was 2,391. 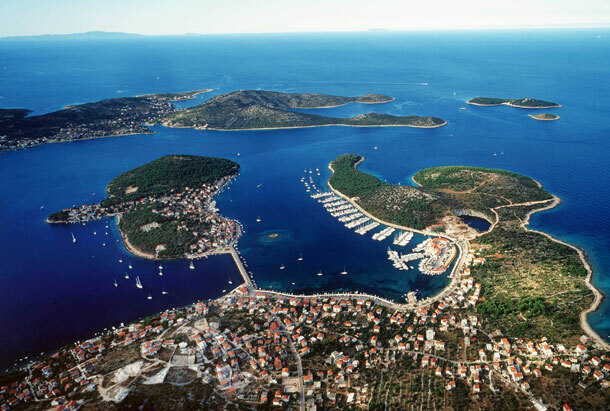 The part of Rogoznica that lies on the mainland was populated in 1390. In 1518 the inhabitants fled from the Turkish army to safety of the nearby islet. The warmest months are July and August when the air temperature is between 25°C and 35°C (77°F – 95°F) and the sea temperature reaches up to 28° C (83°F). Rain is rare. In the past, the inhabitants of Rogoznica lived mainly from fishing and agriculture, and they still don’t forget the traditional jobs in spite of its modern-day orientation as a popular tourist destination. This beautiful fishing village has a naturally protected harbour and the sea is very deep which enables all kinds of yachts to find safe berth there. Thick pine forest, long coastal path, pretty little beaches, islets and bays and the Dragon’s Eye lake amid lime stone rocks – all of these attract many tourists, as well as yachtsmen.